For those of us born in the 1940s and 1950s, remember when penicillin was always prescribed? They never prescribe it now. So what happened to it? I thought I knew the answer, but I Googled it anyway. It is quite an interesting story. Penicillin was the first antibiotic. It was chemical warfare or bacteria and fungi that waged war against bad bacteria. It was derived from mold. We all learned this in school. I can remember seeing mold growing on food and wondering if it was pencillin mold and could you just eat it? Thank goodness, I had better sense. Penicillin was discovered in the late 1920s, but they didn’t ‘t figure how to mass produce it until the early 1940s–just in time for the second world war. It was first used on allied soldiers during WWII. From January to May in 1942, 400 million units of pure penicillin were manufactured. By the end of the war, American pharmaceutical companies were producing 650 billion units a month. So what effect did it have during WWII? For a comparison, let’s look at World War I. In WWI 18% of all deaths was due to bacterial pneumonia. In WWII that percentage dropped to less than 1%. Before penicillin the only thing doctors had for infection were quinine, arsenic and sulfa. I do genealogy research, and I remember reading a list of doctor visits for one of my early Florida ancestors who finally died in 1837. 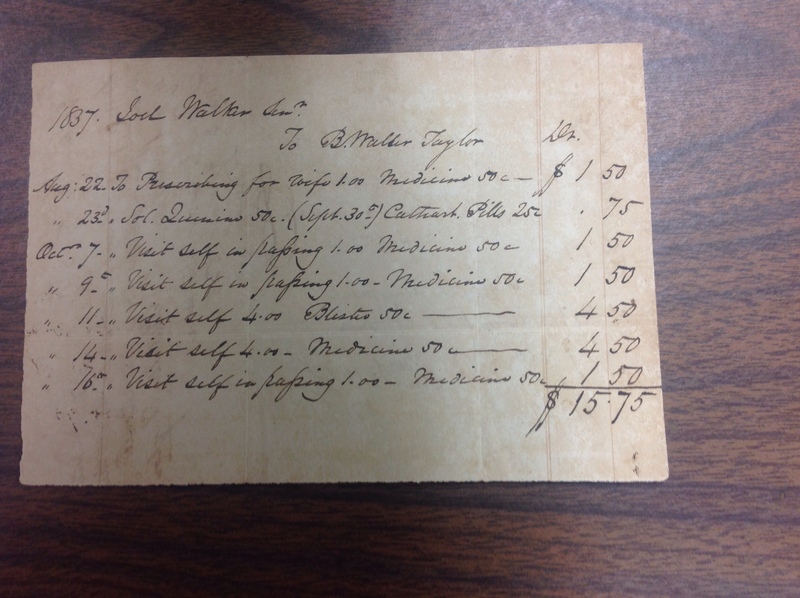 Over a period of almost a month the doctor came numerous times and quinine and sulfa were both used. I know this because the information was part of my ancestor’s probate records when the doctor turned in his final bill for services. I asked my husband why we didn’t use penicillin today, and Chuck said that we probably have better drugs. Frankly, that is what I thought, too. What I found when I looked it up, though, was a little different. 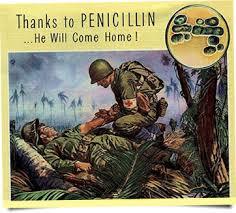 Within four years of 1943 when penicillin was first mass produced, microbes began appearing that could resist it. So I guess you can tell what happened to penicillin. It became obsolete very quickly as a victim of overuse and of bacterial resistance, something that seems to be never ending in the antibiotic world. I do remember taking penicillin when I was young. I remember mostly the early shots. I was born in 1954, and I remember my folks talking about penicillin like it was a miracle drug. It was one of the first antibiotics, so in that way it was a miracle drug. The two Englishmen who developed it were awarded the Nobel Prize for Physics and Medicine. So there you have it. 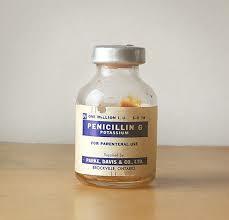 Penicillin was our first antibiotic and also the first victim of bacterial resistance. As I was looking information regarding penicillin liquid injection on internet I came across your article. I was born in 1957 and back in NJ I had the same experience, when I use to have a cold all a I had to do it was to go to the Doctor I remember his “Dr. Corrado” he use to inject me a shot of penicillin a few hours later I was as good as new, today you spend a fortune on medicines and nothing seems work as penicillin use to. I wonder if is still exist a doctor that world prescribe penicillin on these days. Can you share any valuable information regarding this topic? I will appreciate, Thanks! I believe some doctors do in some situations, but they tend to use newer antibiotics today. I believe a lot of people may be resistant to penicillin, but I’m unsure. I’m afraid I do not have any “valuable” info regarding the topic. Thanks for commenting.